Thousands of people will be coming together to pack over ONE MILLION meals and we need you to be one of them! 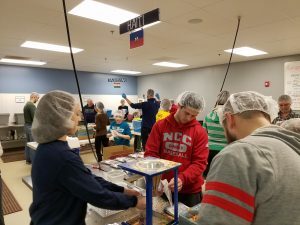 This volunteer packing experience will be at North Central College in Naperville. At least 6,200 children die each day from hunger-related causes. Feed My Starving Children (FMSC) is a Christian non-profit organization committed to feeding God’s starving children hungry in body and spirit. Volunteers will be scooping ingredients, weighing serving bags, sealing bags and packing boxes. Minimum age to volunteer is 5 years old. It’s a fun, upbeat, team atmosphere. Please register below.